Hepatitis A virus can cause Hepatitis A, which is a potentially serious form of liver disease by attacking the liver. Non-travel-related hepatitis A infection is rare in North America as the virus is usually found in developing countries with very poor sanitary conditions and hygiene practices. It often takes a long time to recognize that a food-borne disease outbreak is underway because cases can be dispersed geographically. Taking into consideration that the incubation period of hepatitis A is usually 14 to 28 days, it can be difficult to find the source since people cannot recall with precision what they ate weeks earlier. An example of successful investigation is the recall of hepatitis A contaminated pomegranate seeds in British Columbia in early 2012 by comparing the foods the infected people had bought in previous months. Those food purchasing histories were compiled from their crockery story loyalty cards, pomegranate seeds in a frozen fruit mix were eventually identified as the source of the infection. At a very early stage, with only six cases, the investigators were able to see that the infected people had purchased the same brand of a frozen fruit mix containing blueberries, strawberries, cherries and pomegranate seeds. The following test eventually showed that on e lot of pomegranate seeds from the supplier was contaminated with hepatitis A and a recall was ordered. Although hepatitis A is rare in Canada and the few cases recorded each year generally are in people travelling in or returning from countries where the virus circulates, occasionally someone who becomes infected will transmit it to others in Canada. Therefore, it is necessary for the public to understand its transmission pathway and the prevention methods. -Waterborne outbreaks, infrequent, usually associated with sewage-contaminated or inadequately treated water. -Close physical contact with an infectious person, although casual contact among people does not spread the virus. -Improved sanitation, food safety and immunization are the most effective ways to combat hepatitis A. -Several hepatitis A vaccines are available internationally. 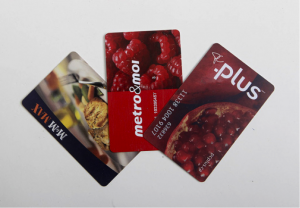 Using the loyalty card is a very interesting and a new way to track the food that is responsible for the food pathogens. Although there might be some privacy concerns, the information era do help us a lot. That’s really interesting. I wonder if they use credit card and debit card tracking to trace back those who purchase affected foods as well. It’s also scary that Hepatitis A is found in berry mixes, in which consumers will make smoothies and drink it raw. Wow, I never thought that grocery’s loyalty card can play such a huge role in a recall investigation. Since it is such an efficient tool to be used to track food purchase history, perhaps they can adopt this method and use it in a larger scale. For example, the Government can come up with initiative to propose a card system where consumers track their food purchase history nationwide. This can be done in collaboration with grocery stores and restaurants. This is the first time I heard that grocery store loyalty cards can help investigate the foodborne illness infection and recall. Actually this can be applied widely to even restaurants since a big portion of the foodborne illness happen in the restaurants. Since many customers would not pay attention to the food safety news or the recall announcement after they purchase the food products, they may still consume the infected foods which have been recalled. I think if a tracing back system can be built up using loyalty cards will be very useful. I agree with Yichen that the Government can utilize a card system to track consumers food purchase history. If a person got sick, they can quickly identify the suspicion food product; and if an outbreak happens, this system can group all the patients food record and find out the common food product. If this card system is in use, it will speed up the foodborne illness investigation process and reduce in personnel costs. I think this is very interesting. Never thought that the loyalty cards could help to trace back the purchases, as we only regard this as a method of saving money. I guess after this outbreak many people started to get a loyalty card not just for saving money but for health issues (just kidding). However, I am quite curious about those who did/do not have a loyalty card. How to trace them down then? It’s really interesting to see that loyalty cards played a very important role in detecting the virus. As hepatitis A viruses can result in serious liver damage, it’s good to hear that it has been detected early in the outbreak. I also agree with Yichen with having cards that can track grocery listings and other food consumptions made by an individual. This would help the detection method a lot faster and lead to better prevention in the future. Since there are more and more pathogens that are developing in food and increased number of outbreaks around the world, these kind of implementation seem very efficient. Thankfully that non-travel-related Hepatitis A is uncommon in North America, but there is definitely still a need to be aware of it! It’s interesting how loyalty cards can be helpful in an outbreak investigation! Tracing back the purchase and recalling the product can definitely helpful. It would be a helpful too if the customer signed up as a member, in addition to collecting points and benefits, the system records the products that the customer has purchased. Maybe in this way the recalls can be easier done because the personal information of the customer can quickly be found. I agree with Susanna that it is quite scary to know frozen berries may be contaminated with Hepatitis A. Many consume this type of product raw without awareness that it may even be a source of foodborne pathogens at all. This is also a very interesting way of finding the source of outbreak! By searching for a common thread among purchasing records, the time of investigation can really be shortened. Maybe because of this, customers would be more willing to put down their actual information when having to fill out forms at food retails stores as well! This is such an innovative and simple way of tracking our diet records I can’t believe no one has thought of it before! Thank you for the eye opening article. One of the largest hurdles to correctly identifying the source of a foodborne outbreak is the patients being unable to recall food they have eaten a while ago, especially for pathogens with a long incubation period. By being able to access their shopping record can no doubt prompt their memories if not recall completely. We can even make this a larger-scale project by having all sorts of supermarkets and restaurants participate, in which the consumer may have the option of recording down their purchase every time they visit. Not only will this benefit health officials and merchants, consumers can also benefit from being able to recall their favorite food from favorite places at a moment’s notice. Personal information exploitation, however, is still a concern, which should be tightly regulated if this were to happen. I never know that grocery membership cards can be used in outbreak investigation, and it really inspires me of how creative data collection could be. As Dr. Wang said in the Big Data lecture, the way of thinking is consistently changing. How to discover potential source of data has recently become crucial in systematic problem solving. Even after data collection, the 4V of the data could also influence the final outcome. People should take more advantages of Big Data, and invent more applications of Big Data in food safety survellence and outbreak investigation. I love how creative this method is used in investigating an outbreak! Its not only simple but also very accurate way of obtaining the necessary information. Just as meggyli mentioned, people might not be able to remember what food they have consumed if they were asked in a questionnaire. Thank you for sharing this interesting article! It is such a clever way to use loyalty cards to investigate into food borne outbreaks! i never thought about this and never knew that they have my purchase history on file when I use my loyalty cards. Hepatitis A is not a trendy food borne disease in North America and vaccination is available to prevent the disease. But once it breaks out, I believe it could be a huge problem since it can transmit through close physical contact with an infectious person and the incubation period is relatively long. It is the quick action of the authority that stopped the situation from becoming serious. Using data from loyalty card to trace the source of an outbreak is a great tragedy to apply to future investigations.